Great Expectations: Will Myanmar’s Election Bring Real Change? 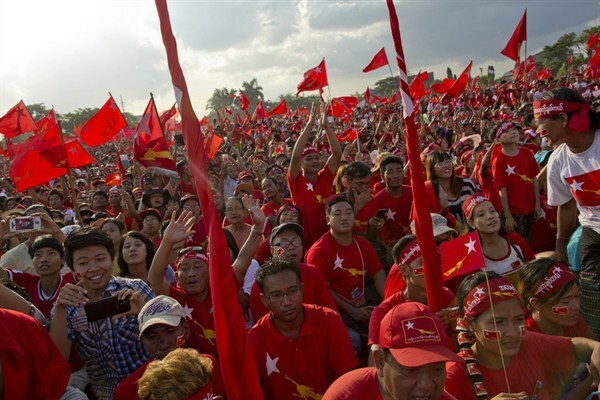 Supporters of Myanmar's Aung San Suu Kyi at a general election campaign rally, Yangon, Myanmar, Nov. 1, 2015 (AP photo by Gemunu Amarasinghe). On Nov. 8, an estimated 30 million people took part in Myanmar’s first free national election in a quarter-century. From the shores of the Andaman Sea to the Himalayan uplands, many lined up in the pre-dawn gloom before voting stations officially opened at 6 a.m. Vying for citizens’ votes across some 1,171 constituencies were 6,189 candidates from a total of 93 parties. For most voters, however, it came down to two. On one side was the ruling Union Solidarity and Development Party (USDP), the drab political proxy of the powerful Tatmadaw, Myanmar’s military, which has ruled the country for more than half a century; on the other was the opposition National League for Democracy (NLD), led by the talismanic Daw Aung San Suu Kyi, a Nobel Peace Prize laureate and international symbol of Myanmar’s long struggle for democracy. Two parties: one symbolizing decades of military rule, the other symbolizing change.